Selenographia is the last of the three works which make up Inconstant Moon, the others being the original guided tours and the Cyclopedia Selenica reference zone. 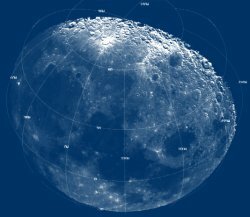 Inconstant Moon has been generously allowed to use the magnificent photographs of the Consolidated Lunar Atlas, and has used these to build a set of 44 mosaic images which continuously cover the entire visible face of the Moon at a uniform scale. It provides switchable overlays of feature names and lines of latitude and longitude, an intuitive system for panning across the lunar surface, a clickable gazetteer of named features and selectable orientation to match any configuration of lenses and mirrors from either hemisphere. In addition, there are some fifty large-scale maps showing other aspects of the Moon such as nomenclature, geology, exploration and folklore figures.